Knowing What Are You Exactly Saying Yes To allows you to say yes slower, know when you can’t complete a task, and propels you forward to achieve more. Leaders and managers can block their progress in other ways. Michael Bungay Staniera, author of The Coaching Habit, shares how the Drama Triangle inhibits productivity and limits employee engagement. 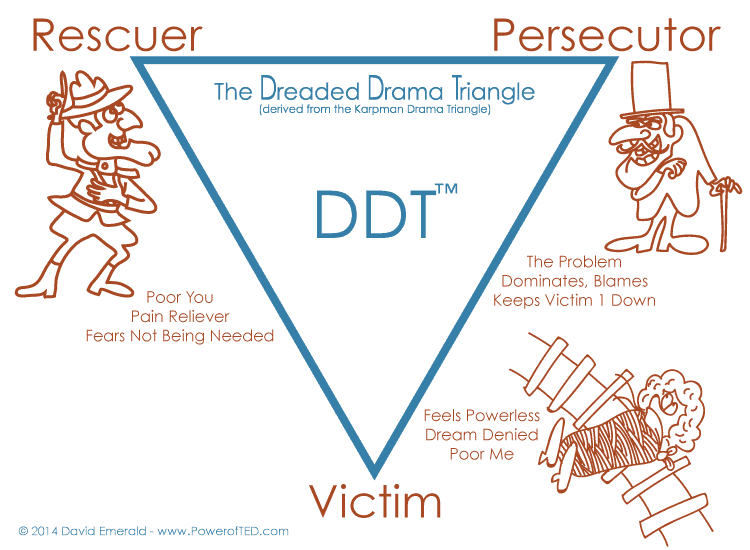 Watch his video to understand more about Karpman Drama Triangle, and how to extract yourself from its grasp. 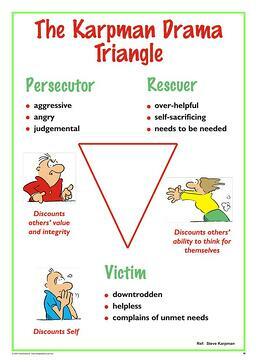 Staniera’s COACHING HABIT VIDEOS offer three more on the Drama Triangle to understand the victim, rescuer, and persecutor role. In The Coaching Habit, Staniera explains, The Drama Triangle starts by assuming that, at least some of the time, we’re playing less-than-fantastic versions of ourselves with most of the people with whom we interact. If you’ve ever found yourself playing one of the Seven Dysfunctional Dwarfs (Sulky, Moany, Shouty, Crabby, Martyr-y, Touchy and Petulant), even when you know you should know better, you get the point…. we’re bouncing around between three archetypal roles—Victim, Persecutor and Rescuer—each one as unhelpful and dysfunctional as the other. As you read the descriptions of each role below, do two things: bring to mind someone who’s particularly adept at each role, and bring to mind the circumstances in which you most commonly play each role. These three labels aren’t descriptions of who you are. They’re descriptions of how you’re behaving in a given situation. No one is inherently a Victim or a Persecutor or a Rescuer. They are roles we end up playing when we’ve been triggered and, in that state, find a less-than-effective version of ourselves playing out. Think of the most annoying person on your team right now, the one who’s giving you difficulty even as we speak. Did you notice that in a flash, you jumped to Persecutor (They make me so mad! ), Victim (It’s not fair, why can’t I get them onto someone else’s team?) and Rescuer (I’ll just keep trying to do their work for them until they get up to speed) all at once? Your Go-to Role We tend to have a favorite role we default to most of the time. When asked to identify which of these roles you play most often, most choose the Rescuer. When we’re in Rescuer mode, we’re constantly leaping in to solve problems, jumping in to offer advice, taking over responsibilities that others should rightfully keep for themselves. We do it with good intentions; we’re just trying to help, to “add value” as managers. But you can already see the price that’s being paid by both sides. You’re limiting opportunities for growth and for expanding the potential of those you’re working with. Rescuers create Victims. We want to believe it’s the other way around (which is also true, but not only true). Seeing the pattern of the Drama Triangle is a strong first step in breaking the working-too-hard pattern of the time-crunched manager. Once you understand the triggers, you can start to reshape the habit. Workplace Drama – END IT! David Emerald Womeldorff – Dallas Growth Summit. 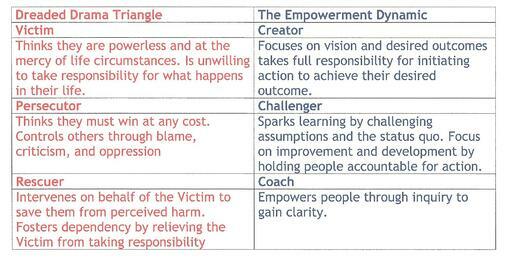 The final blog from taken from Christine Comaford’s Smart Tribes book provides the following chart to help you understand the role you are playing. Empowerment Dynamic allows you to move to the role where you empower others. Making the Shift from Drama to Empowerment To be an effective manager and leader you need to achieve results through others. If you are stuck in any of the roles in the drama triangle you will inevitably fail to get results. The Empowerment Dynamic provides you the ability to get results through your people. Often some of the best potential leaders are only one step away from becoming Great Leaders simply by extracting themselves from the Drama Triangle. Friday I conducted a half day Topgrading Orientation Presentation for a customer who decided to make Topgrading their SOP. They are a solid organization, already doing a good job hiring A players (52.8%). Several ideas sprouted to help you recruit and hire better. That’s our next blog.